Why the injection molding become so popular in plastic product manufacturing? Definitely, if one of the spare parts on your machine or equipment does not function properly, you will need to order a new one for a replacement. However, if your equipment is custom-made, you will have to produce or purchase a customized spare part. But, this process will take a long time, depending on how difficult the part is manufactured and what kind of materials are used. However, if you already have a plastic injection mold which produces parts, it will be quite easy for you to get your part ready in only a very short period of time. Injection molding offers a fast way for you to get the parts you need in time, and at a very affordable price. When scientist Alexander Parkes created the first piece of synthetic plastic in 1855, the manufacturing industry had no idea how the plastic mold would revolutionize the way factory and company thought about and produced parts. Though featuring quite a low cost, plastic injection molding is a fast, easy and the best manufacturing process. It is very possible that you are now reading this article on your computer. But you know what, your computer represents a perfect example of injection molding. It is likely that your keyboard, mouse and computer casing are made out of plastic. Generally speaking, injection molding is often used for any parts that can be mass-produced, but it is also an affordable way to create prototypes, almost as fast as you want them, and the plastic material is very easy to use and amazingly durable, too. That is why the application of plastic materials becomes so well accepted in the manufacturing industry. It is an ideal solution that can meet a lot of your manufacturing needs. 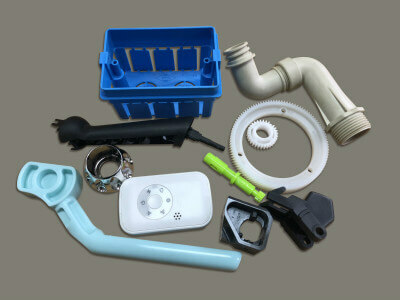 Plastic injection molding is an easy to use process. As a matter of fact, it is very simple yet effective. First, the granularized plastics are loaded into the injection chamber of the injection molding machine through a hopper. Then, there is a reciprocating screw inside the injection chamber that ensures the plastic granules flow into the machine body steadily and evenly. Next, the granules are moved through the heater which melts the plastic into liquids. After that, the liquefied plastic flows into the mold cavity through a nozzle, where it is injected into the plastic mold itself. Inside the mold, a moveable plate will apply certain pressure to ensure that the plastic is hardened. By virtue of its ease of use and the fact that plastic is low priced and is able to be molded into almost any shape, the application of plastic injection molding has gained great popularity in the manufacturing industry. If you are a user of plastic parts, what you need to do is only to keep some extra parts at hand, so that you do not have to waste any of your time on producing the parts again in case of parts wear and tear. Since there is already a plastic mold in your desired shape, your production activity will be made more time-saving and money-saving.